The other week I received a little surprise parcel through my letter box. Now, I love receiving post that isn’t something boring or expected. 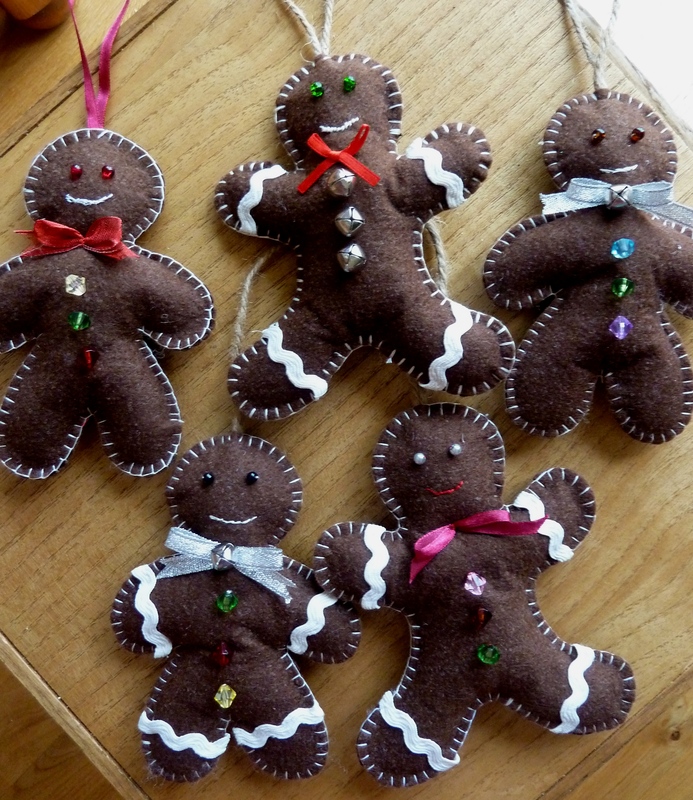 I opened it up to find these cute little gingerbread men Christmas decorations. Aren’t they sweet? I just love them and the note revealed that they were made by Aunty Angie (not my real Aunty but a close enough family friend to be honoured with such a title!) Not only had she been kind enough to send me these for my first ever Christmas tree in my own house but she had also written down a little recipe for me. 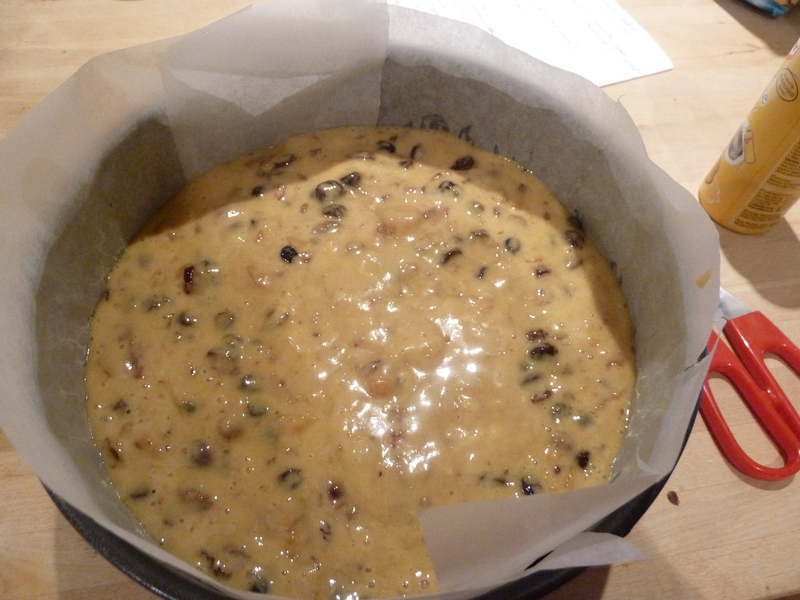 It was a simple recipe for a boiled fruit cake with the note “…if you love a moist fruit cake to cut and come again this is the one – could even be quickly iced for a Christmas cake.” I agree on both counts! 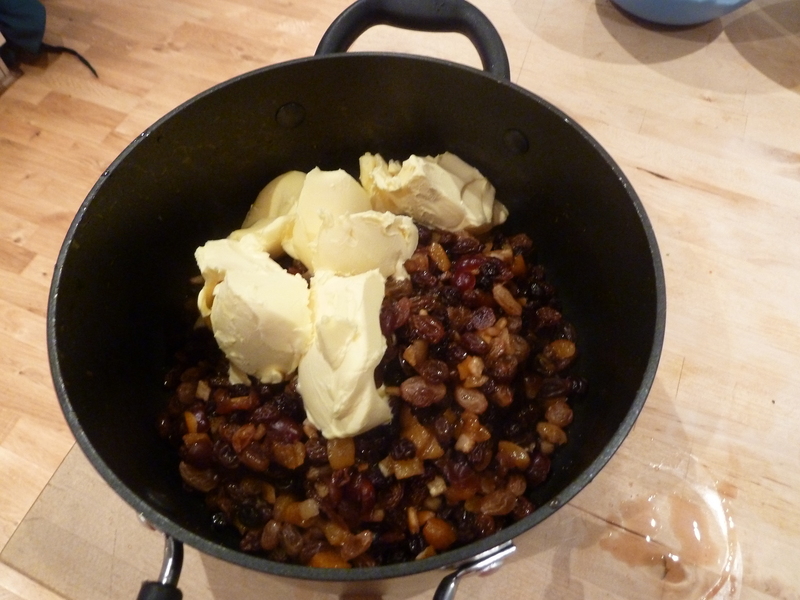 If you haven’t had the time to make your Christmas cake well ahead of time and feed it with brandy then this is the perfect replacement…you won’t be disappointed. The first thing to do is boil your fruit. Just a note about the fruit here first I think. In her recipe, Auntie Angie said she usually just uses raisins. 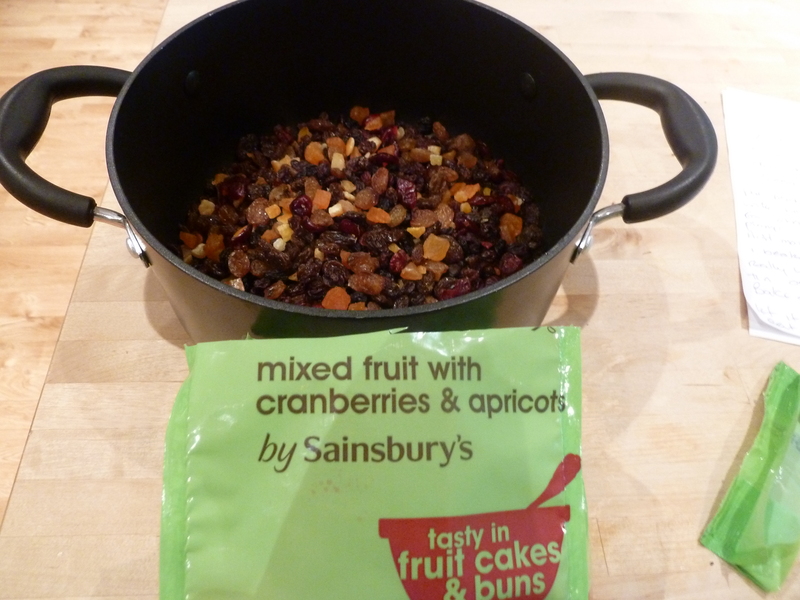 However, I found a bag of mixed fruit in Sainsbury’s with apricots and cranberries as well. I thought this would be nice as we are coming into the festive season and also I think both of these fruits are great to bake with. 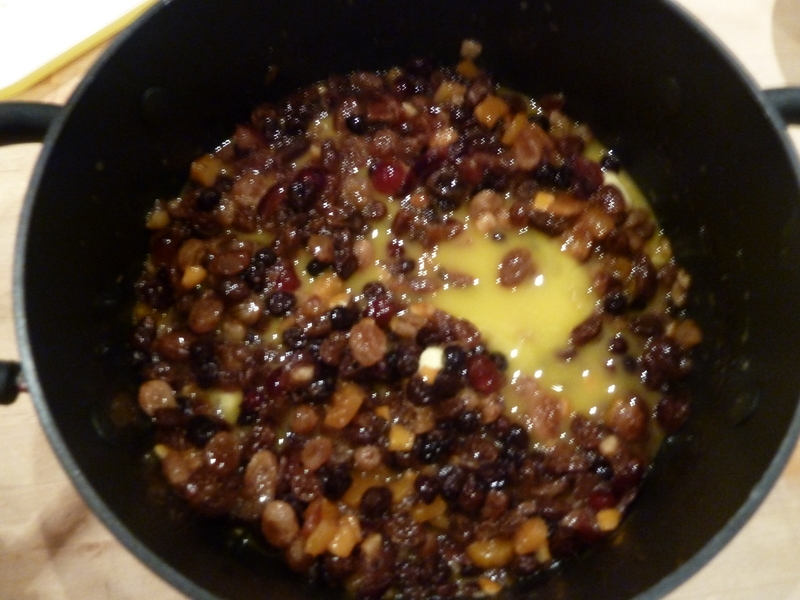 I also added a few extra cranberries and some currants. To be honest, I think you could add whatever you wanted and the easiest option is to either use whatever you have in the cupboard or just buy a bag of mixed fruit from the supermarket. 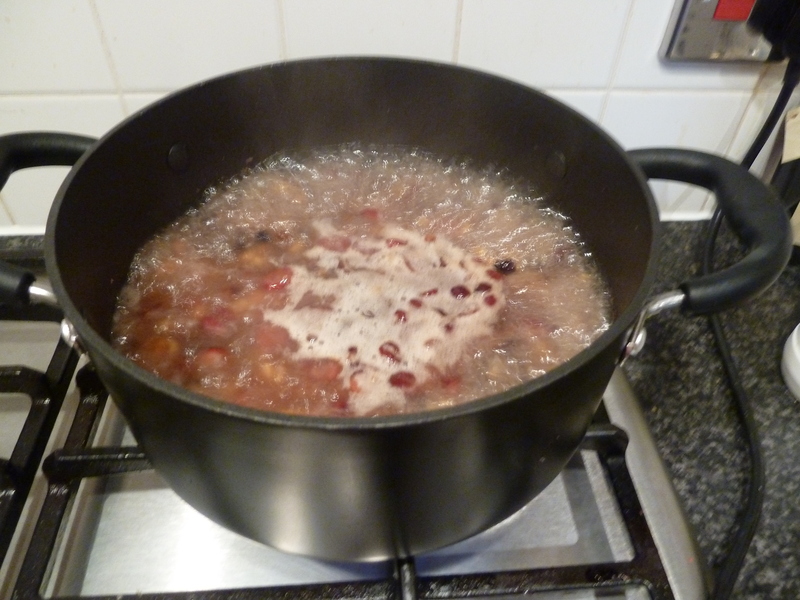 Whatever you choose, put your fruit into a large saucepan and cover with plenty of water. 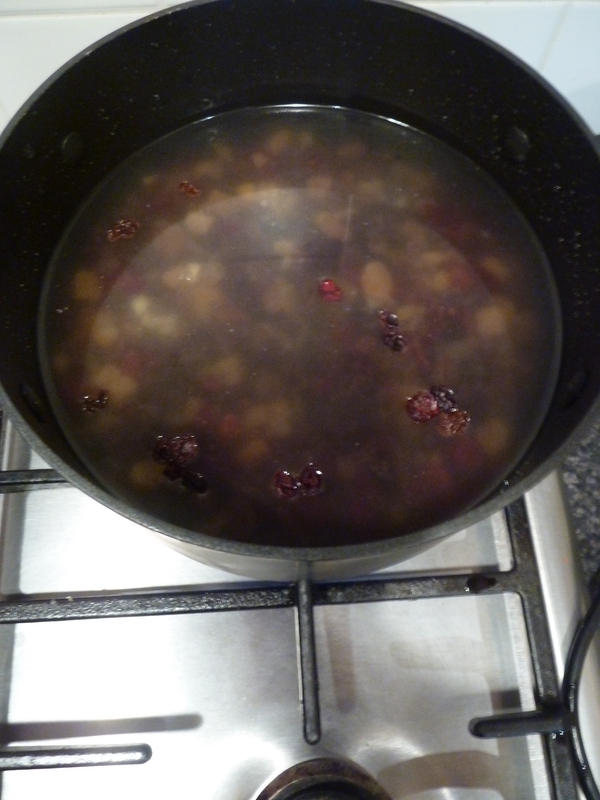 Bring this to the boil and then leave it to simmer for about 20 minutes or longer if need be. What you’re trying to achieve is nice plump fruit. If you’re using mixed fruit then some will plump up quicker than others (cranberries seem to go almost instantly whereas currants are more reluctant). Just keep it going until they are all relatively plumped up. When the fruit is done, pre-heat the oven to 160c. 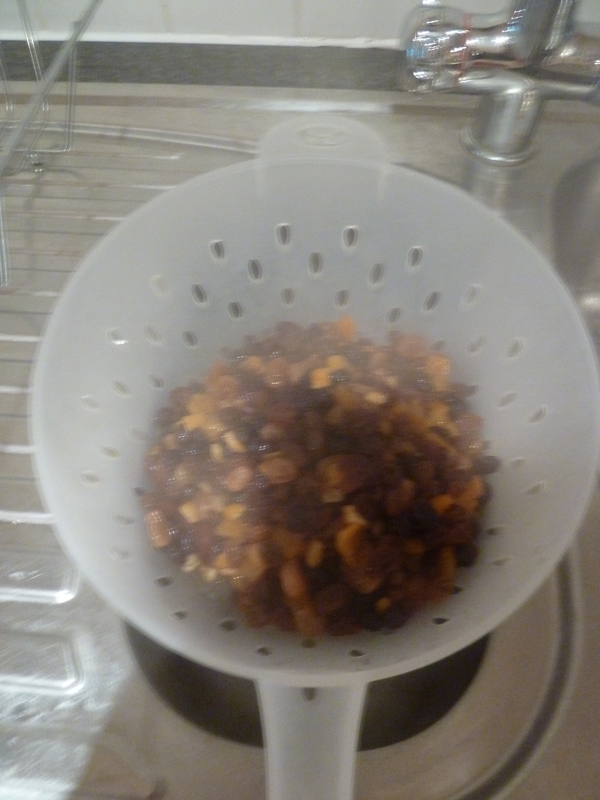 Strain the fruit through a colander or sieve to get rid of the water and then return to the pan. Add the marge and let it melt. 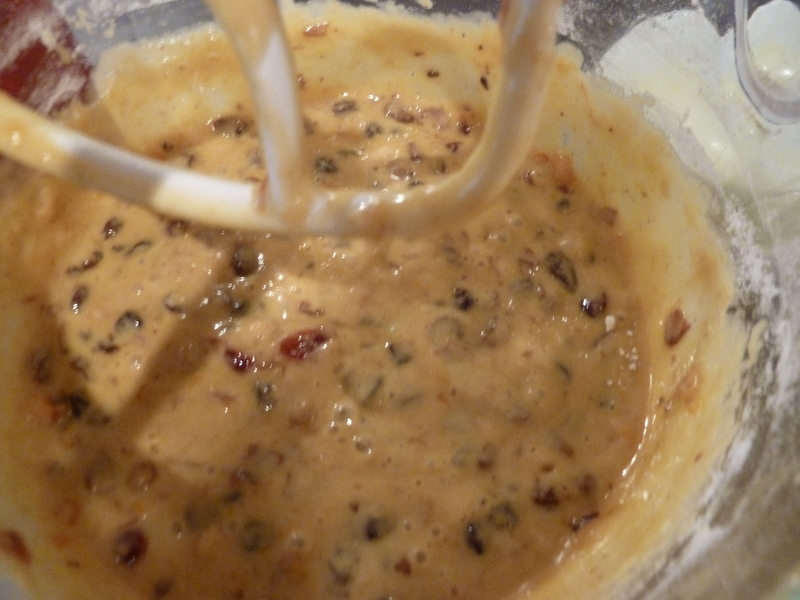 I then transferred this to the bowl of my mixer but you could just put it in any large bowl if mixing by hand. Add the sugar and the beaten eggs and beat it really well. Then add the flour and beat that in until well combined. 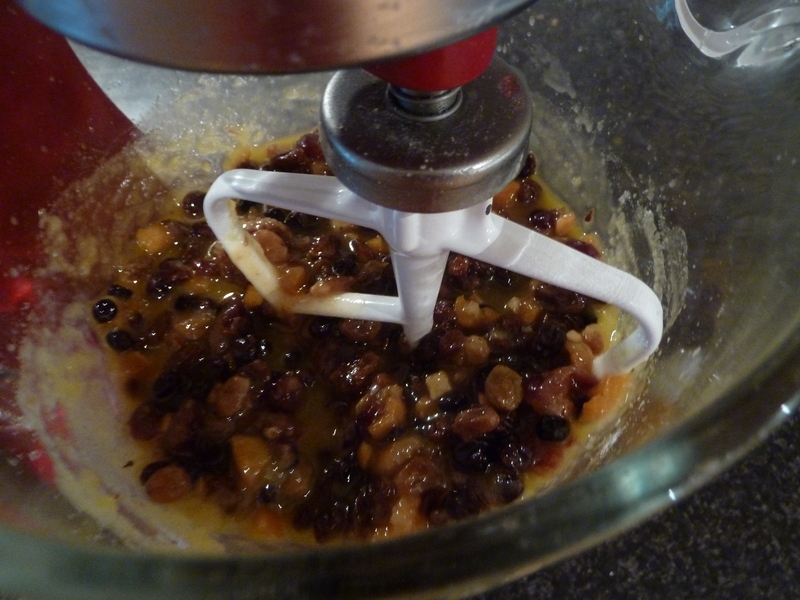 It will be much runnier than a normal fruit cake so don’t worry about that. Pour the batter into a deep 8 inch round cake tin (or 2 loaf tins Aunty Angie suggests but I haven’t tried it in loaf form yet). I actually lined my tin for once with baking paper, as this cake goes in the oven so long and the paper does help to keep a cake like this moist whilst it’s cooking. Place it in the oven for about an hour and a half. This of course depends on how quick and hot your oven is. Mine probably took about an hour and twenty so do check with a knife or a skewer and if it comes out clean it’s done; if not, it needs a little longer. When it’s done, let it cool on a wire rack (if you can wait that long because the smell is just SO good). My boyfriend just couldn’t wait so we ended up eating the first slice warm. It was nice but I definitely prefer it once it has cooled. So, that’s it! Simple eh? 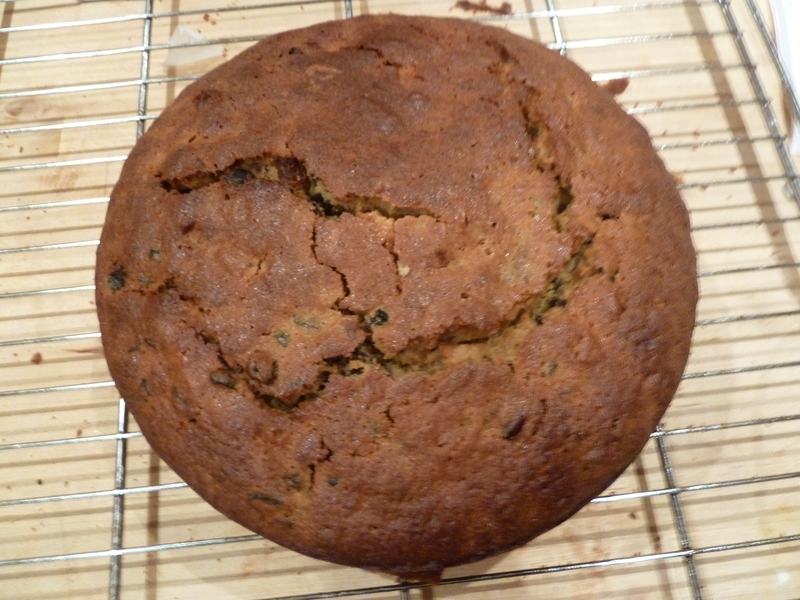 Not much effort for a deliciously moist fruit cake and, if like me, there are only two of you in your house you can still bake this cake without fear of it going dry before you’ve eaten it all. Ours lasted five days and was still lovely and moist on the fifth day so just keep it in an air tight container or wrap it well in tin foil and you will be fine. I was planning on icing the top to show how you could make this into a Christmas cake if you wanted but, as I said, my boyfriend couldn’t wait! So, if you do try that out I would love to see a picture. I’d suggest heating a little apricot jam, brushing that over first and then adding icing and/or marzipan. So a big thank you is in order to Auntie Angie, not only for the beautiful gingerbread men that look so great on my tree, but also a fantastically easy and wonderfully tasty cake recipe! I hope you all try it because I really cannot sing it’s praises enough! Let me know if you do.